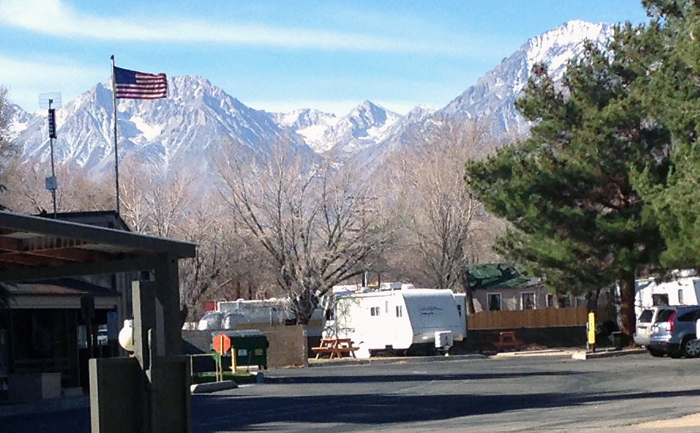 Jan & I have taken jobs as assistant park managers at Highland’s RV Park in Bishop, CA. These are seasonal positions from April through October, so we’ll be back at Crazy Horse Campground in November. If things work out, we may do it another year. We’ll see. Anyway, it’s a great opportunity to pick up some extra money for a couple of things we’d like to buy (washer/dryer, kayak) + we’ll be able to explore the Sierras in our off time. The area around Bishop, CA is stunning! We thought the mountains surrounding Lake Havasu were great, but the Sierras are . . . well, take a look . . .
We’re both pretty excited about this. In early February Jan found an ad for the positions in the Lake Havasu City paper. She called the campground, talked to the full-time managers (a husband & wife), and we drove up to Bishop last Thursday (February 5th). We stayed at a Travel Lodge in Bishop (with our dogs too) overnight and spent Saturday morning meeting with Wendy & John, the managers. Nice folks who have been managing the park for over a decade. The job consists of managing the front office (typically campground reservations), cutting the grass, cleaning the bathrooms, filling propane bottles, and general maintenance. Basically we’d be working weekends + managing the park when Wendy & John are on vacation. Highland’s RV Park is about one-half mile outside of Bishop on Highway 395. Bishop looks like a cool little town . 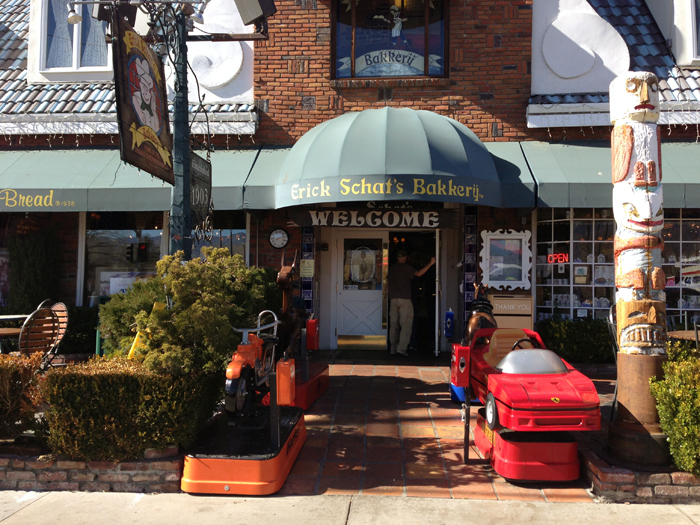 . . Erick Schat’s is a neat bakery in town and Bishop is a fishing center for the local lakes, but the city’s claim to fame is the Mule Days. So we’ll probably leave Crazy Horse the last week of March in order to get a week of training in before we start in April. Here’s are some photos & a video from our 400-mile trip to Bishop . . . The Lone Pine skate park behind the McDonalds . . .
That sounds like good news to me. The Sierras are magnificent and the town looks inviting. I think youâre going to have some good times there. Congrats. Will be waiting to hear about the experiences. Mary H.
Woo Hoo! Congratulations! You will meet new people, make a little spending money and see new things… like birds! Can’t wait to hear about your new adventures. Wow! That looks like a really nice place to spend the summer! But we are sad you won’t be coming back to Wisconsin. Wow! those mountains look awesome! You’re having lots of fun and I’m so glad you share with us. Now I need to look up Bishop to see where you’ll be. T & J…it is a beautiful area. Have been to Shatts, good “stuff”. Have camped & went fishing at Lake Mary & been to. June Lake…,you’ll love it. Be sure to check out the sky- wonderous!. Hey guys, sounds like you are having great adventures, we’ll be seeking you out in a few years to come. A vacation in a rented RV last summer convinced us that we will love it. Just have to get one kid launched. Debra of Debra, Kathy & Rose? If so, great to hear from you. We are living the “RV Dream” & as you gathered, loving it. We’ve been in the South West for a year (never thought we’d love the desert) & probably for the next 2 years before we hit the road again. Anyway, feel free to contact us via our blog or email (hughes54311@mac.com) & we’ll catch up.